Our services include wood floor sanding, finishing, restoration, repairs to wooden floors. Installations wood flooring including solid engineered and laminated floors . We sand all types of wooden floors, from pine floor boards, oak old and new, parquet mosaics, herringbone blocks as long as it’s a wooden floor I can sand and finish it. Pine floor boards, if some boards are lose lay can be re-fixed. Nails punched down if needed. Damaged boards can be repaired or replaced with new or reclaimed to match in. Concrete fire place, it is quite common to pull up the carpet and find the concrete fire place in the floor. This can be knocked out and replaced with matching timber put back in staggering the joints so there is no sign of a fire place being there. Loose blocks, with block floors it is quite common to find one or two loose especially if over the floor is over 50 years old due to the old style type of adhesive. These can be restuck using new adhesive. With mosaics, 5 into one pattern the blocks which are the size of your fingers and have 5 in groups going one way and 5 the other, some of these can come lose especially around the edge where there has been a carpet and the gripper when took up pulls the block up with it due to the gripper being nailed in. These can simply be re-stuck. 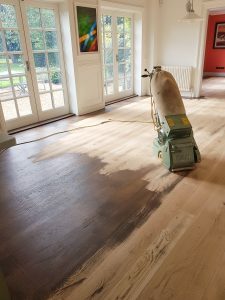 If you have any gaps in your wooden floor, block, mosaics, strip or engineered flooring, clean dust collected in the bag of the machine can be mixed with a resin and spread over the floor then the floor sanding can take place up to a smooth finish. This achieves the correct colour and the best results. On pine floor boards this method can be done but there is a risk of the filler falling out over time due to the gaps being sometimes large, not tongue and grooved so there is nothing to support the filler, movement on the floor when walked on and the natural expansion and contraction of the floor in different temperatures. Some other methods on pine floor boards are using a mastic in-between the gaps, this stops drafts and is more forgiving with movement. A v shaped plastic can also be used and cut to size then pushed into the gaps and does not fall out and moves with the floor. After the wood floor has received the floor sanding treatment, I use all types of stains mainly solvent based to coloured oils or waxes. These can be mixed and usually can match any colour. I have colours on sample boards to show you or when sanding the floor I can try a few samples on the actual floor then re-sand them off. These often give the best results enhancing the grain and giving a natural appearance. Waxes come in matt and satin. Oils give a very matt appearance and a nice feel to the floor. They are less susceptive to scratches and areas can be repaired more easily than lacquers, but do require a little bit more maintenance. With all finishes i only the leading brands like Bona, Junckers and Osmo and are all put on the correct application rates. Not like some other companies that say three coats but are spread on so thin to increase the drying time to make sure the job is done in one day and uses less material. Also all lacquers are 100% polyurethane the hardest wearing and better quality than the cheaper acrylic. Machines being used are Lagler machines these are German made and are leaders in floor sanding dust less technology with 98-100% dust extraction keeping dust to an absolute minimum. Over time your floor will receive wear... but to avoid the floor sanding cost in the future a good maintenance schedule will need to be implemented ! The biggest killer of floors is grit, if this is not swept off regularly every time you walk over the floor you are sanding the surface away and will dramatically shorten the life span of the floor. So regular hooving, sweeping is good practice. A good maintance kit will also be needed which I can supply which are desighned to clean the finish which I have put on for you. A lot of the cleaners that you can get from your local store are too agresive and eat away at the finish and another common problem is sloshing too much water on the floor. The least amount of water needs to be used as possible. Maintenance can be carried out on lacquered floors mainly commercial or high traffic family homes like kitchens by giving the floor a light sand and re-sealed every few years depending on the level of traffic it gets and how well you look after the floor. This way it is possible to never have to sand the floor back to bare wood again. On waxes these can be deep cleaned with a orbital machine with a nylon pad and a coat of wax buffed on, this dramatically improves the appearance on a worn and dull looking floor. Oiled finishes can also be lightly sanded and re-oiled bringing then back to life.